With the proliferation of smartphones featuring quality cameras, affordable DSLR cameras, and even point-and-shoot and prosumer cameras that do most of the thinking for you, everyone is becoming an architectural photographer these days! And yet few architecture, engineering, and construction professionals have learned how to take effective architectural photographs. 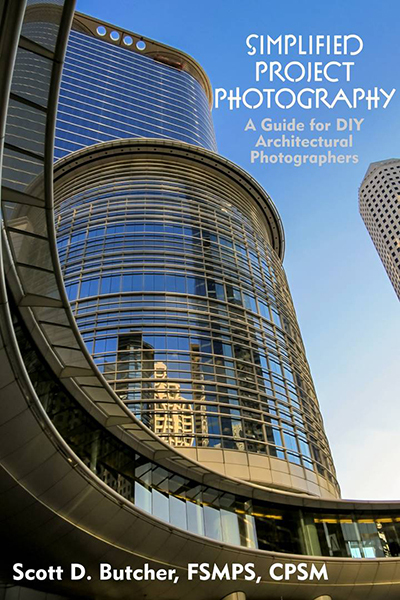 In 2001, I wrote and published one of the first-ever photography ebooks, Simplified Architectural Photography. Of course, in 2001, how many of us were reading ebooks? There were no Kindles or iPads or smartphones. An ebook was a PDF file meant to be read on a computer screen. Perhaps I was too far ahead of my time! That original ebook was all about using film cameras – should you use 100-speed or 200-speed film? What filters do you need for architectural photography? Digital cameras were in their infancy and JDB Engineering had just purchased our very first digital camera: a massive beast that stored low resolutions photos on a 3.5″ floppy disk drive! I’m sure that camera is now in a museum somewhere! In the intervening years, digital camera technology has made monumental advances, and almost everyone in the A/E/C industry today walks around with a camera in their pocket. The need for quality images has never been greater – websites, proposals, social media posts, presentations, brochures, advertisements, signage, etc. But too many of us rely on crappy photos to get the job done! There is still very much a need for quality architectural and real estate photographers. And yet, how many times is that not an option for us? We don’t have the time. Or the budget. Perhaps the project is not yet finished and ready for our professional photographer. Maybe the proposal is due tomorrow and we need to take pictures today! Or the project isn’t “worth” the expense of hiring a professional. The reasons are myriad, but the end-result is the same: we must act as DIY architectural photographers. Our tools vary greatly: smart phones, disposable cameras, digital single lens reflex (DSLR) cameras, old-school film cameras, point-and-shoot cameras, or “prosumer” cameras, which are DSLR-like, but not as large or advanced. Several years ago I set out to update Simplified Architectural Photography, but it became apparent pretty early on that the book needed to be entirely re-written. I put the idea on the shelf. And then over the past few years, I began presenting about architectural photography to professional societies. Today I even have an AIA CES program on the topic that is worth 1.0 LU. The first time I ever gave a presentation about architectural photography was in the mid-1990s, and have things changed greatly since then! “Architectural photography” is a pretty broad term that encompasses photography of buildings, sites, engineered systems, highways, and cityscapes. In recent years, “real estate photography” has branched off, and refers more specifically to photographing residential buildings, be they houses, apartments, or condos. Real estate photography is also often quick-in, quick-out, lower cost than hiring a “true” architectural photographer. In the A/E/C vernacular, we are really talking about project photography – whatever form it may take. I have a lot of respect for professional architectural and real estate photographers, and truly see their value. Ansel Adams believed that the majority of making a good image was accomplished in the darkroom, not in the field, and architectural photographers today spend more hours massaging images in Photoshop than you can possibly imagine! It truly is an art. So why am I publishing a book about project photography? When I was in my senior year of college, finishing up a marketing degree, I became very interested in photography and enrolled in the New York Institute of Photography program. Although my college studies primarily focused on marketing management, I did squeeze in an architectural appreciation course, and had a term paper worth 85% of my grade. I chose to perform an architectural study of my home town, spending many weekends wandering the streets, photographing and later researching 250 years of architecture. 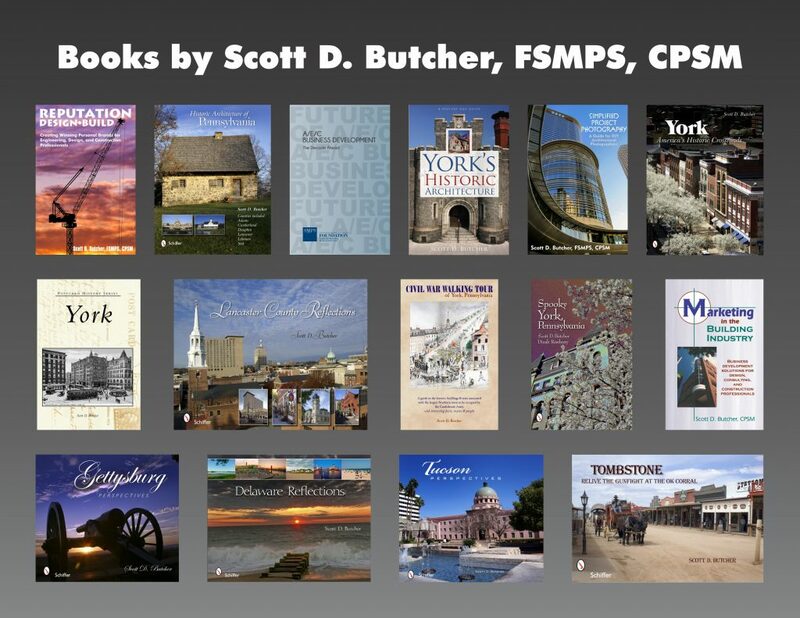 Books photographed, written, and/or co-written by Scott D. Butcher, FSMPS, CPSM. After graduating, I found myself working the A/E/C industry, and immediately began putting my photography skills to work. Alas, these were the days of film – and no way to view an image after you took it! – so I managed to waste countless roles of film because I didn’t really have much of a clue how to photograph architectural interiors! But I persevered, read an architectural photography book, tagged along with an architectural photographer on a few shoots, and then became involved with photographing buildings, landscapes, and cityscapes as writer and photographer for a series of visitor and relocation guides. A decade removed from college, I dusted off my architectural research and created a virtual tour and architectural appreciation website for my community, which I later expanded and repurposed for several local interest books – one of the first being York’s Historic Architecture, essentially a rewrite and expansion of my college term paper! I’ve since photographed and authored more than a dozen books, and have more than 1500 photographs “in print” in books, visitors guides, relocation guides, magazines, etc. Plus the thousands of photos I’ve shot for my company over the years. So that knowledge is all embedded in my new ebook, Simplified Project Photography: A Guide for DIY Architectural Photographers. In it you’ll find close to 300 photos – what to do and not do! – and about 35,000 words of advice, so it wasn’t a small undertaking! It’s a simple PDF file written very conversationally, as though I was presenting it to you – which makes sense since this book closely parallels my companion presentation! There’s tons of advice for shooting exteriors and interiors, including common challenges and what to do when you encounter them. And while some of the tips are specific to more advanced cameras, the majority will work on your smartphone as well as your DSLR. I’ve also included a section on post processing. For the book I’m using Adobe Lightroom, which is fairly inexpensive and intuitive – no Photoshop required! Simplified Project Photography will not make you a professional architectural photographer, so please don’t lose the phone number or email of the professional you normally use! However, if you follow the advice within its virtual pages, you will get better results – results that you can use to enhance your marketing efforts. And even though the book is directed towards those who work in the design and construction industry, the tips will help you with your travel photography, blog images, journalism, etc. I originally planned to release this as a Kindle ebook, but with the launch of jdbIQity – which provides marketing and business development intelligence for A/E/C firms – I thought there’s no better way to “hang out a shingle” than with a free gift! Click here to download Simplified Project Photography: A Guide for DIY Architectural Photographers, and feel free to share it with friends and colleagues. Drop me a note to let me know if you like it. And if you need help with marketing or business development strategy, or a trainer or facilitator for your team, let’s talk! Email me at sbutcher@jdbe.com or call me at 717-434-1543. These architectural photography tips are fantastic. Thanks a lot for the tips.